Posted January 28, 2014 by admin . Search Engine Optimization and Paid Search Advertising are both individually effective strategies in promoting your services or brand online, but together, they can be a powerhouse. Cohesiveness between the two helps to build a highly effective campaign with the most profitable keywords and content. The more your logo and name are seen online, the more effective your brand strategy becomes. If you are doing both SEO and PPC together, a user may see you multiple times during a single search, helping to establish and build your presence in a particular market. By using the combined analytics from both organic and paid listings, more data can be obtained and analyzed for the most effective results. You will be able to view both organic and paid search keywords that have the highest conversion rate, and use this data to create a better overall strategy. Organic keyword data is extremely valuable when figuring out which keywords customers use to get to your site. By importing the most frequently used keywords from organic results, your PPC campaigns will start out strong and receive higher click-through rates, as you are already aware of what is triggering an active response in a potential customer. This is particularly applicable for long-tail keywords, which convert even higher since they are so specific. Long-tail keywords are search phrases composed of three or more words, providing a more descriptive search for the user. If you are using Google Adwords for your paid search advertising, you can easily link up your Google Analytics account to your Adwords account and be able to access both quickly and get the bulk of your data all in one place. If you are managing your own Pay-Per-Click Advertising or SEO and have trouble understanding what your data means and how to utilize it effectively, AMG can help! We have experts in paid search, search engine optimization, social media, email marketing and more. Create a complete marketing campaign today with a customized package tailored to fit your business needs and goals. 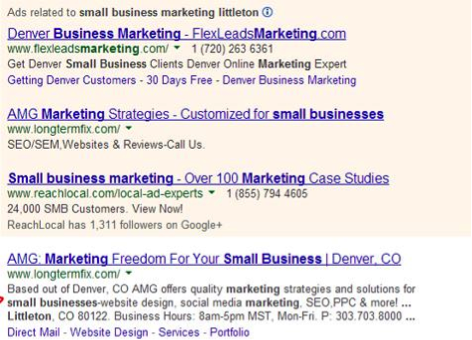 Get a free marketing assessment from AMG today, or call 303-703-8000.